Kay Brothers Amery Vineyards Block 6 Shiraz is the flagship wine from this producer and is made from 4 acres of vines in excess of 100 years old (planted 1892). This 2004 vintage is a wine of exceptional quality whose concentration reflects the very small yields of intensely flavoured grapes harvested from this plot. Only 1400 cases of Block 6 were made the fermented wine receiving 28 months maturation in 60% new American oak and 40% in new Hungarian oak barrels. McClaren Vale wine at its best. "...the finest example of this cuvee since the 1998. 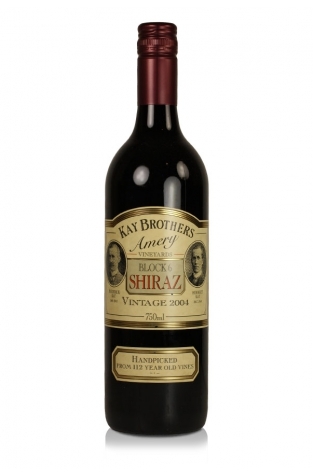 It is an awesomely concentrated Shiraz with an inky/plum/garnet/purple colour and a sweet nose of roasted meats, dried herbs, ground pepper, blackberries, and cassis. This intense, full-bodied effort boasts a profound depth and richness as well as layer upon layer of awesome concentration and length. While approachable, it should hit its peak in 5-6 years, and last for two decades or more." He awarded it 98 points which we agree is very well-deserved.